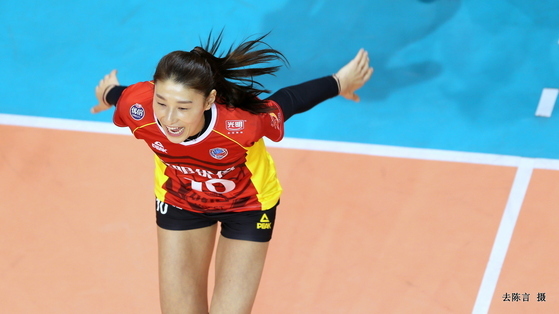 South Korea’s proud volleyball player Kim Yeong-koung is showing an outstanding performance in Chinese Volleyball League. At the game with Jiangsu on March 3, Kim scored 26 point, which was the largest among all the players from both Shanghai and Jiangsu. With the help of her excellent performance, Shanghai won with the set score of 3-2 (24-26, 25-22, 25-20, 16-25, 15-10), going up for the champion’s league with 3 wins and 1 loss. If Shanghai wins over Tianjin, Kim Yeon-koung would hold trophies in four national leagues, following those in Korea, Japan, and Turkey. Shanghai’s victory will make the athlete a strong candidate for the season’s MVP. Kim currently is the fifth highest scoring player with a total of 432 points, which makes her the highest scoring player in her team. Her abilities to spike shined the most at decisive moments of several games. When she was in the Turkey league, Kim Yeon-koung was the highest-earning athlete among the world’s volleyball players in both men’s and women’s leagues. However, her yearly salary decreased from $1.6 million to about $1 million as she moved to Shanghai team in May 2017. Kim regardless chose Shanghai because of its adjacency to Korea and less number of games, considering the possibility to represent her home country in the national team at upcoming Olympic games.